I also needed pliers, scissors, a crappy paintbrush and toothpicks for epoxy mixing and spreading. Nothing tricky here. 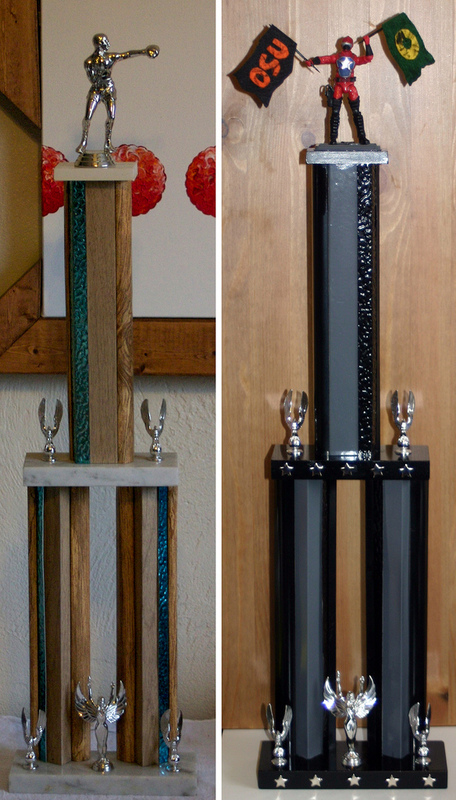 As I talked about last week, I dismantled an old, falling apart trophy and painted all of the pieces either gloss black or gloss grey with spray paint. Then I reassembled. My husband spent some time digging the screw out from the bottom of the old figurine and then I used pliers to tighten all of the tension roads back together. 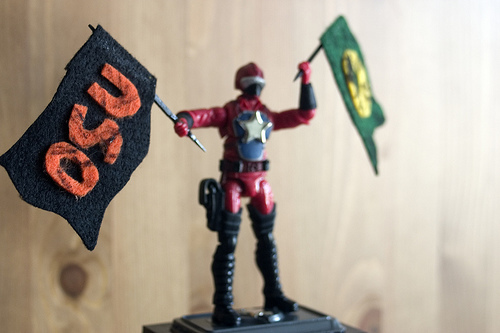 I epoxied the GI Joe’s stand on top, then the GI Joe to the stand, and a star over the Cobra logo on his chest. Then I made the flags, using craft felt and tacky glue. I sprayed some black paint into a paper plate and brushed it on the flags to distress them, as well as using it to touch up the scuffs I had made reassembling the pieces. All told, it cost about $25, the bulk of which were the spray paint and the trophy. A side-by-side comparison, I think it looks way way better now. Sadly UO was beaten in tournaments at the Civil War LAN so this guy will be living at OSU until UO gets a chance at a rematch. I agree looks much better now!